Dockingstick is now shipping worldwide through Amazon.com , Order yours today!! 2013 Winner "Best New Product" NMMA Consumer Choice Awards. Please see purchase page to order. New Instructional Video posted. See Instructional Video page. 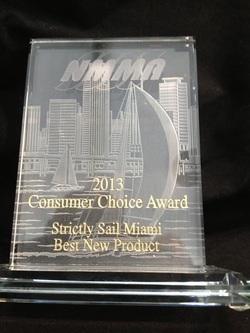 DockingStick is proud to announce that we've been awarded the 2013 NMMA Consumer Choice Award for "Best New Product" at the Miami International / Strictly Sail Boat show. Docking a boat is the most difficult task to master in boating. Regardless of your boat docking procedure, and your level of boat docking experience, a little bit of help goes a long way. Docking Stick is the newest and most user friendly boat docking tool to hit the market in years. Simple, compact, and uncomplicated, this series of docking aid allows deployment of a single or multiple dock lines in seconds. Docking a boat, when done improperly, can result in more than a bruised ego or tension between spouses. Many serious injuries have occurred from boat docking accidents. The Docking Stick series of docking aids and docking tools facilitate the boat crew's and/or operator's deployment of one or multiple dock lines without the need to disembark from the vessel. With the Docking Stick boat hook adapter, your reach is only limited by the length of your boat hook and line. Once a line is deployed, the person at the helm can use the motor and the dock line to draw the vessel into the desired position. With multiple dock lines deployed, crew can rest assured that there will be no risk to life and limb. The Docking Stick docking tool will function on cleats, pilings, mooring balls, bollards, or just about anything which you can get a loop around.